Make Up Air Units are used to bring in fresh conditioned air into a space to make-up the air that is exhausted from a building. In the case of condominiums and other high rise residential buildings, exhausted air from washroom exhaust, cooking exhaust, natural building ventilation systems is replenished by the Make Up Air unit. Make Up Airs are usually designed for peak ventilation and occupancy periods are run at constant volume. For Make Up Air units with electric or modulating gas heat, minimum flow must be maintained to prevent frozen coils or overheated heat exchangers. 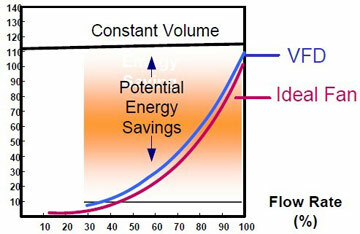 Verify minimum flow with the equipment manufacturer. Lower minimum flows may be realized for Make Up Air units with hydronic heating or cooling coils - increasing the energy savings. Frequency inverters can be interlocked with time clocks or exhaust fan contacts to enable the programmed speed. For example, the frequency inverter may be programmed to run at 60% flow during weekdays from 2 to 4 PM and from 1:00am to 5:00am. And 100% flow at all other times. Indoor Air Quality (IAQ) sensors can be used to override and increase the speed of the the frequency inverter when the carbon dioxide (Co2) increases above the override IAQ setpoint (800 to 1200 ppm Co2).